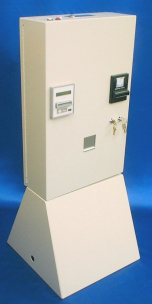 The M7506 CreditVend™ Copier Controller accepts nickels, dimes, quarters, dollar coins, $1, $5, $10 and $20 bills and proprietary magnetic debit cards to vend one or more images, depending on the amount of monetary or card value available. The M7506 comes with a standard capacity changer, but a premium double capacity changer is available as an option. One price is available for all image types. The M7506 employs SmartCoin™ technology to ensure that change is always available for every conceivable vending situation. Value can be added to cards, and value on cards can be used to make images, but value on cards cannot be converted back to money. Foreign coin mechanisms and bill validators are available for select countries. Please contact us for foreign vending applications. The M7506 is available in an ethernet version for copy and print vending from a release station. Click here for information on copy and print vending. • AccumaVend™ technology allows user to add monetary value "on the fly"
• Dimensions: 25.5" x 16" x 5.5"
The M7506 is warrantied against manufacturing defects for a period of one year from date of shipment, to be determined by the serial number on its main board's microchip. Warranties for components of the M7506, if different, supercede this general warranty. Specifically, the MDB changer is warrantied against manufacturing defects for a period of two years from date of manufacture, to be determined from the first four digits of its serial number (wwyy). Additionally, the premium changer is warrantied against manufacturing defects for a period of two years from date of manufacture, to be determined from the first four digits of its serial number (wwyy). The bill validator is warrantied against manufacturing defects for a period of two years from date of manufacture, to be determined from the first four digits of its serial number (wwyy). Note that the card reader is warrantied against manufacturing defects for a period of one year from date of shipment, to be determined by the serial number on the card reader itself. Advanced Technologies (Tekvend) agrees to repair or replace at its discretion any of the above items within the warranty periods specified for them. Advanced Technologies (Tekvend) agrees to pay ground return shipping and insurance on all warranty repair or replacements. Advanced Technologies (Tekvend) cannot be responsible for any damage that occurs to product returned to it due to inadequate return shipment procedures. The shipper is responsible for ensuring that return shipment packaging is adequate and that the return shipment is adequately insured. Advanced Technologies (Tekvend) does not warranty its product for damage caused by abusive use, vandalism, improper installation, and improper field repair. Installer is expected to use the original copier specific harness (sprig) supplied by Advanced Technologies (Tekvend), and install the M7506 on the originally specified copier, unless otherwise authorized.